A classic character is making her return via comic books this summer. 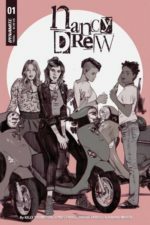 Dynamite Entertainment has announced a new Nancy Drew comic book series, from writer Kelly Thompson (Marvel’s Hawkeye, IDW’s Jem and the Holograms) and artist Jenn St-Onge (Tee Franklin’s Bingo Love). The new series involves Nancy as a 17-year-old sleuth returning home and solving a mystery involving her friends. The cover suggests what I’ve always suspected: Nancy and her pals are baby dykes. Is This J.J. Abram’s Next Hit?